Hampton University’s athletic programs are known for making noise that causes others to notice and the next few days will be an example of that. On Saturday, February 13, a five-plus year journey for the Lacrosse club-turned-varsity program will play in their first official game as a Division I program. They host Roberts Wesleyan College at 12:30 p.m. in Armstrong Stadium. Prior to the start of the game, ESPN will broadcast “SportsCenter on the Road” from 10 a.m. to noon., live from Armstrong Stadium for the first time ever. 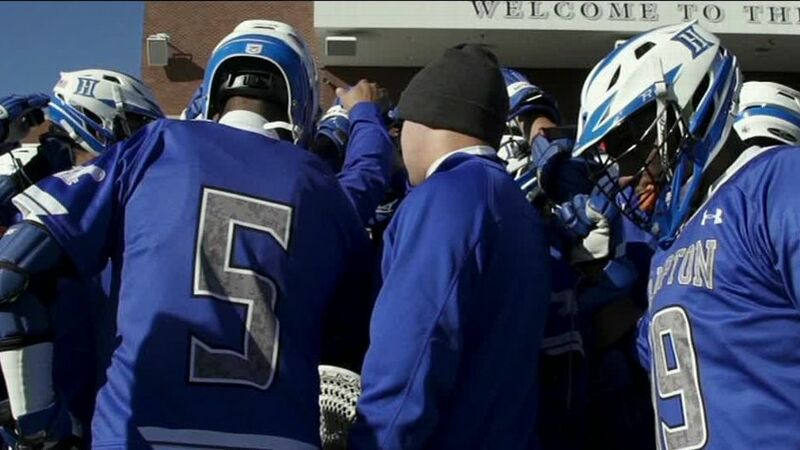 Last year, the Hampton Script reported that the Lacrosse team was set to become the first-ever HBCU D-I program and the first HBCU men’s team since 1981 when Morgan State disbanded their D-II program. Fast forward to almost a year later and the players, who, along with their head coach Lloyd Carter, have worked tirelessly to get to this point, are eagerly awaiting Saturday’s events. Team captain Darrel Kidd, a senior journalism major from White Plains, New York, said it “feels surreal” to be finally playing at this level. Junior kinesiology major Devin Williams from Long Island, New York, who joined his sophomore year and has been playing since seventh grade, says he remembers the early days for the team. “Started off with about 5-10 guys playing on Bemis [Lawn] with no equipment. We came out of pocket and paid for our own stuff, fundraised our own money…we were always hungry to reach the next level,” he reminisced. Kidd says that they realize the jump from club to D-I will not be easy but they feel that as long as they work hard and play within their game, they will be competitive. And he also hopes, regardless of the outcome on Saturday, the fans will stay with them. “We have a saying on our team that says “Stick Wit’ Us”…we hope to grow as a program and we want our entire university behind us. History has been made,” Kidd proclaimed. In addition to this date, Hampton Nation should also circle February 15 on their calendar. The Hampton Pirates men’s basketball team will take on the Morgan State Bears in the Convocation Center with a very special guest in attendance. ESPNU will televise the game live at 7 p.m. The MEAC rivals previously played on January 6 at Hill Field House in Baltimore. The game was close and ended up going into overtime but the Pirates came away with a 83-80 win. When asked about what he thinks about the Pirates’ latest TV game, head coach Edward Joyner said, “I think it’s big. Big for the university more than anything else because it helps not just basketball recruiting and athletic recruiting, but recruitment for the university as a whole and we’re happy about them coming. The team had great showings against other MEAC rivals recently. On January 30, their game against Norfolk State, which had the largest crowd of the season (8,123), saw Hampton emerge with a 10-point win. On February 8, the Pirates traveled to Washington, D.C. to face their other rival, the Bison of Howard University. The game was tied at 65 with a minute left until guard Lawrence Cooks made a 3-pointer with the 43 seconds left, giving the team the eventual win. After years of learning each other’s strengths and weaknesses, the Pirates have improved all-around and Cooks, a senior sports management major from Charlotte, North Carolina, recognizes the team’s strong chemistry. “I feel like we click together. We know each other well enough to know what [everyone] likes to do and when we play hard together, we’re a tough team to beat,” said Cooks. Joyner emphasized his team’s dedication and mentioned it has been the key that has gotten them to where they are and hopes it will take them where they want to go on Monday.